My fear of drowning is holding me back. I am having swimming classes in school but I'm getting anxious. Last year, I was afraid to even step into the water. I would walk back and forth holding the edge while the other classmates are swimming and practicing strokes. I panic when I try to float, I panic when the people make waves in the pool, I panic about drowning, I panic when no one I knows is next to me. I would love to know how to swim but how can I even swim if my fear is getting in the way? I told my mom about this but she doesn't believe me and that I'm just overreacting but every time I step into the pool and can't feel the floor, I have rapid heart rate and I know it's my fear acting up. This class is only 45 minutes long do I don't have time to take my time. I get scared easily even when washing hair dye off my hair. How can I step into the pool without freaking out? I have worked with people like you many times over the years and your fears and anxieties are not uncommon. First of all you are to be congratulated on taking the bold step of wanting to learn to swim and giving it a go (although you probably don’t get much choice at school). There are many people out there that would love to learn to swim but will never bite the bullet and do it, so well done so far. It goes without saying that your fear of water needs to be addressed before you can learn to swim. Learning to swim after conquering your fear of water will be much easier, and not made harder by the fact that you had a fear in the first place. Let’s deal with some facts here, and please forgive me for stating the obvious. We are human beings and not fish; therefore we do not belong in the water. attitude to the water, such as past experiences. Your first and most important hurdle to overcome is learning to deal with your face getting wet and your ability to breathe whilst in a water environment. There are some things you can try out at home in your bathroom such as splashing water onto your face and blowing bubbles into the water. If water in and around your eyes is a contributing issue then try wearing some swim goggles. The sensations of water on your face and the tickling feeling of bubbles blowing around your mouth and nose will probably freak you out to begin with, but don’t let that put you off. You are learning to control your own Diving Response and over time having a wet face and blowing bubble will become second nature. Then you will begin to relax. Go to your local pool with a friend and try these things out. In water of comfortable standing depth, get your face wet, practice breathing, maybe even practice submerging your face completely. Always remember to slowly breathe out into the water and not hold your breath. This will help to relax. The swimming pool environment is far more intimidating than your bathroom at home. A larger amount of water, people jumping around and being noisy and not to mention all those people doing the one thing you really want to learn – swimming! The whole experience can be very off putting for someone who just wants to become comfortable in the water. This is why it is very important that you only do what you are happy and comfortable to do in the pool. Take things one step at a time and go at your own pace. 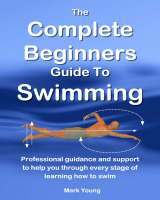 Once you have learnt how your body behaves in the water and getting splashed and submerging your face become second nature then learning to swim is simply a matter of what to do with your arms and legs. That’s the easy part! Do not be pressured by your 45 minute time limit or by what others are doing in your class. Learn at your own pace. Rome was not built in a day and if you are determined enough then you will do it.